Squeezing a cheap handgrip device in the comfort of your own home three times a week could become the latest weapon in the battle against Australia's rising rates of hypertension. Image: Prof Neil Smart: "With isometric exercise, you don't need a gym membership or expensive equipment and you can do it any time"
University of New England's Professor of Clinical Exercise Physiology, Neil Smart, has led an international research study that has concluded that isometric exercise is just as effective as medication for many sufferers of high blood pressure, which affects one-third of all Australians over 18. Hypertension, a major risk factor for heart disease, stroke, kidney disease and other cardiovascular complications, accounts for 6% of all visits to general practitioners in Australia and costs the Pharmaceutical Benefits Scheme millions. However, anti-hypertensive medications only effectively control blood pressure in half of those people prescribed them. 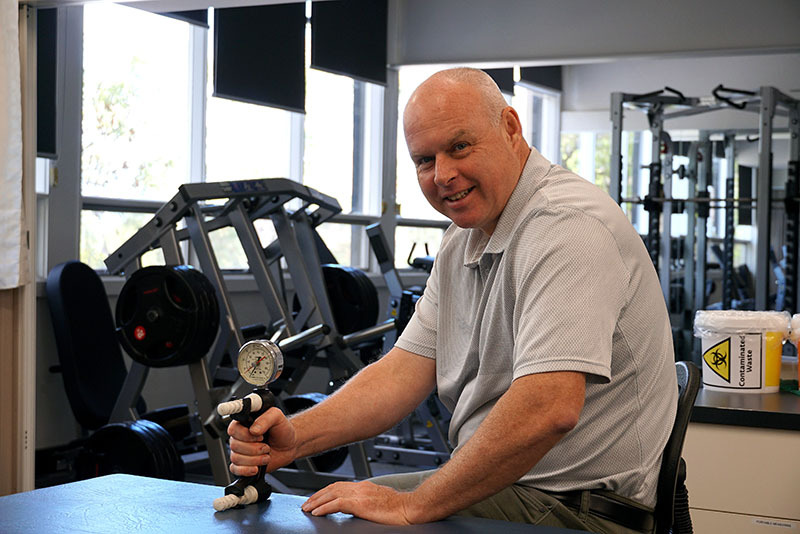 Professor Smart, from UNE's world-leading isometric research centre, investigated how isometric exercise helped more than 300 people who took part in 12 studies world-wide. He confirmed that the simple exercise - generally sustained muscle contractions by squeezing a handgrip or leg squats against a wall - had a "clinically meaningful and statistically significant effect". "Exercise has long been recommended as part of lifestyle changes to combat hypertension," Professor Smart said. "However, we have dispelled the myth that isometric exercise is unsafe. "Instead, we've proven that thrice weekly sessions provide the same benefits as taking one blood pressure medication and lower blood pressure a little more than a traditional aerobic or resistance exercise program." In the quest to motivate hypertension sufferers to stick to healthy exercise regimes, more convenient and inexpensive isometric exercises could become an important tool. "Many people can't get past the fact that you can sit on the couch, watching TV, do these exercises without raising a sweat and produce such a profound effect," Professor Smart said. "With isometric exercise, you don't need a gym membership or expensive equipment and you can do it any time." Aerobic and resistance exercise activities have long been the cornerstone of lifestyle recommendations to manage high blood pressure. Isometric exercise was traditionally avoided because it was feared that the act of squeezing elevates blood pressure. Professor Smart and his colleagues found that while there is an initial blood pressure elevation during squeezing, once stopped this is followed by a "rebound response" that sees blood vessels adapt and become more elastic, thus lowering blood pressure. Moreover, the increases in blood pressure during squeezing are less than one would typically observe with aerobic or resistance exercise and heart rate remains the same with isometric resistance training (IRT). The overall strain on the heart is actually lower with IRT compared to aerobic or resistance exercise. While acknowledging that aerobic exercise is likely to have broader health benefits, Professor Smart said there is generally "limited compliance". Recent studies from Germany suggest that less than 15% of people adhere to traditional aerobic or resistance exercise programs. "Only a small percentage of patients are compliant long enough to obtain the health benefits of exercise," he said. "We are constantly looking for ways to motivate people to stick to aerobic exercise or for more manageable alternatives, and isometric exercise is one of them. "You don't need a gym membership, you don't need expensive equipment; you can do it any time of day, anywhere. "The success from lowering blood pressure might even encourage people to get off the couch and perform other types of exercise to manage their weight and glucose levels more effectively." The International Isometric Working Group that contributed data for the study comprises scientists in Canada, Brazil, Belgium and England. The American Heart Association and American College of Cardiology, in their 2018 guidelines, identified isometric exercise as an effective adjunct treatment for hypertension. Professor Smart, who himself has hypertension, is now revising the exercise and hypertension guidelines for Exercise Sports Science Australia, preparing data for a prestigious Cochrane Systematic Review, and applying for funding to conduct a large trial to examine which types of people with hypertension may benefit most. It is a 12 month study that will ask participants to either do (i) an isometric program (ii) Aerobic walking program – both 4 weeks at UNE and then home-based up to 52 week mark or (ii) act as a control (these people will later be offered an exercise program after they complete the study. Inclusion criteria Medicated hypertensive, aged 40-75 years, not achieving regular exercise target of 2.5hrs weekly. Exclusion criteria Those with arthritis, carpal tunnel syndrome or wrist or other injury that impedes IRT/AET. Participation in another clinical trial in last 30 days. The findings were published in the March 18 volume of the Journal of Hypertension.